After disappearing from the market of Webb’s Ribbon Adder in the end of 19th century, another similar device appeared with much better market success. The so called Bassett Adder is another continuous band machine and was in production from 1909 till the end of 1930s. The device is a small 8 positional adder with dimensions 10,8 x 7,5 x 2,2 cm and weight 80 g. There were at least two models of the Bassett Adder. The first is made entirely of wood, paper and celluloid. 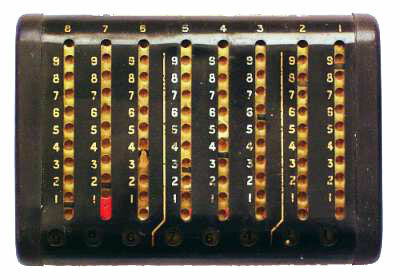 On this simple device, numbers are entered with a stylus by pulling down the perforated bands in each column. The user must pay attention, however. Every band has a black mark between each tenth hole. When pulling down a band using a hole above a black mark, one must remember to add one to the adjacent left column for the carry. The second Bassett Adder (see the lower image) is more complex. It has a wooden core with celluloid number bands, but it is encased in tin. The second device has an automatic feature to remind users to carry their tens—a red flag appearing in the column to the left signaling when it is necessary to carry. The device was named after a manufacturer of adding machines—James Hunter Bassett (13 April, 1888–1932) of Chicago, who produced and sold this device since 1909. In 1911 he advertised the device (see the nearby image) in Scientific American as the “Bassett $1.00 adder” sold by J.H. Bassett & Co. of Chicago. Some of devices, produced by Bassett are inscribed Patent applied for or Patent pending, but Bassett never obtained a patent for this device (Charles Webb also had problems receiving patents for similar device). Besides the company of Bassett, there are at least 4 other companies, which manufactured and sold the device . It was advertised from 1909 as “Clark’s New Adder,” a product of the Glenn C. Clark Manufacturing Co. of Chicago. In another add from 1910, it is described as the “$1.00 ADDER,” sold by Commercial Specialities Agency of Chicago. In 1911, it was advertised by Timesaver Co., Chicago, under the name Speed. In 1920s the device was sold by Johnson Smith & Co. of Racine, Wisconsin.